A monstrous tornado at least a half-mile wide roared through the Oklahoma City suburbs Monday, flattening entire neighborhoods and destroying an elementary school with a direct blow as children and teachers huddled against winds up to 200 mph. At least 51 people were killed, and officials said the death toll was expected to rise. The Oklahoma Medical Examiner's Office told NBC News late Monday night that at least 20 of the 51 fatalities accounted for so far are children. 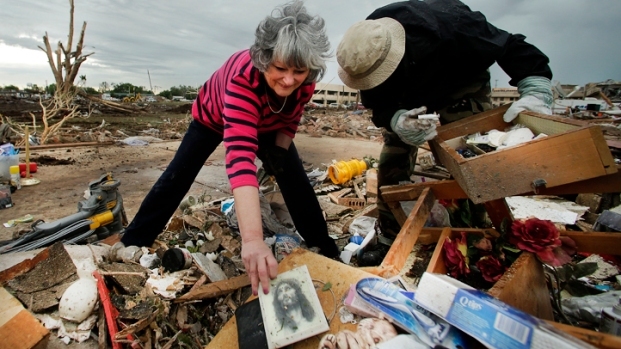 The scene in Moore has been described simply as "total devastation." 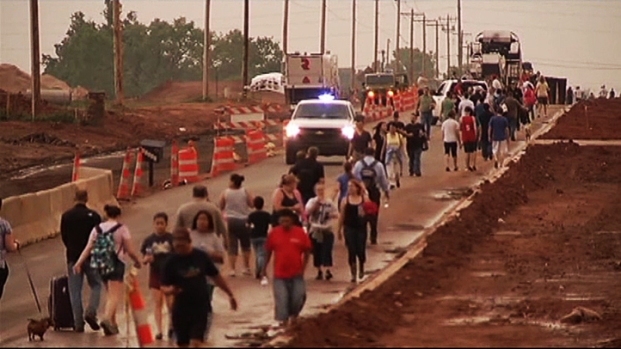 KFOR-TV's news helicopter followed along as the massive tornado cut a large swath leading up to and through Moore. 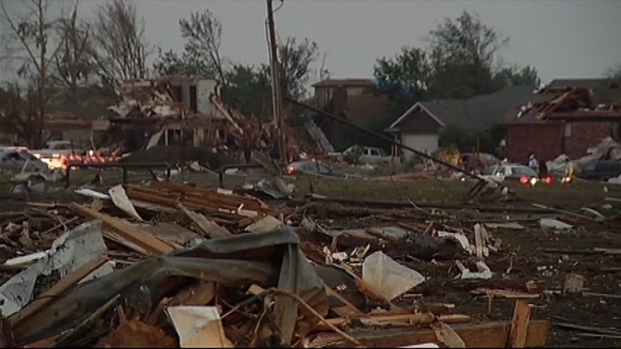 The tornado was estimated to be on the ground for about an hour, cutting a swath 20 miles long and about 1 mile wide. The debris ball is estimated to be at least two miles wide. More than 140 people were being treated at hospitals, including about 70 children. And search-and-rescue efforts were to continue throughout the night. "I got a phone call from her screaming, `Help! Help! I can't breathe. My house is on top of me!"' Thronesberry said. Chris Calvert saw the menacing tornado from about a mile away. KFOR's Lance West reported at about 6:30 p.m. that the search at the school had turned from a search and rescue into a recovery effort. Seven children found drowned in a pool of water at Plaza Towers are among the 51 killed in the storm, the state medical examiner's office told NBC News. 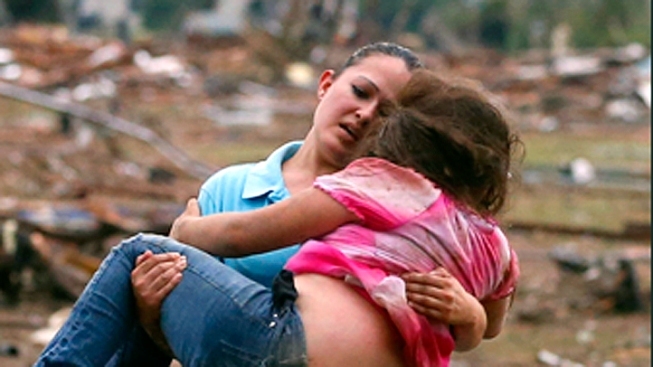 There are multiple reports of teachers laying on children and using their body to protect them from flying debris. The tornado also destroyed Briarwood Elementary School. A man with a megaphone stood near a Catholic church Monday evening and called out the names of surviving children. Parents waited nearby, hoping to hear their sons' and daughters' names. Spokeswoman Brooke Cayot said nine of 57 patients who are being treated at the Integris Southwest Medical Center were listed in critical condition after Monday afternoon's tornado. Nineteen were in serious condition and 29 were listed in fair or good condition. OU Medical Center spokesman Scott Coppenbarger said his hospital and a nearby children's hospital are treating approximately 85 patients, including 65 children. The tornado hit a small hospital in Moore, but all of the 30 patients inside "amazingly" survived. Moore Medical Center spokeswoman Kelly Wells said the hospital was "pretty much destroyed." All of the 30 patients survived, as did all of the staff members at the 46-bed acute care hospital, she said. Wells said 13 patients were transferred to other facilities, though it wasn't clear if they were moved because of injuries sustained in the tornado or because of existing medical conditions. Texas Gov. Rick Perry released the following statement after learning of the horrific devastation in Moore. "The images emerging from Oklahoma today are a terrifying reminder of how quickly the force of Mother Nature can devastate entire communities. Our hearts are heavy for all Americans who have been affected by the recent outbreak of storms across our country. State emergency assets in Texas will remain on alert and stand ready to help our neighbors any way we can." KFOR meteorologist Mike Morgan estimates the tornado to be an EF-5 in strength (peak wind speeds greater than 200 mph) and the damage about three times as bad as the May 3, 1999, tornado that tore through the same town. That 1999 tornado had the highest winds ever recorded near the earth's surface. Morgan also said about 30 square miles have been affected by damage. One of the 16 tornadoes that killed six people and injured dozens in Hood County last week were rated an EF-4 with wind speeds of about 180 mph.